Both Amazon and Alibaba are born as online stores. In fact, an essential part of the business is still based on the revenues coming from the online store. 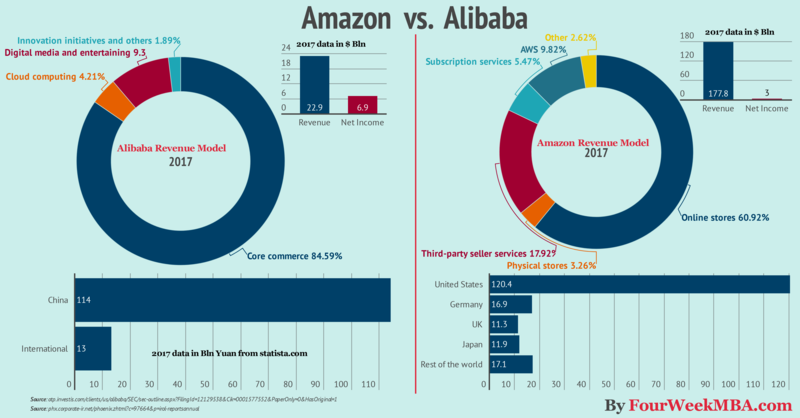 Indeed, Alibaba makes as much as 85% of its revenues from the core commerce, while Amazon makes almost 61% of the online stores. It is important to notice how Amazon has been decreasing the dependence on the online stores’ revenues while increasing the revenues from AWS and Amazon Prime services. In a way, it seems like Amazon is switching to a subscription-based business model (as of now the process might still take a long time). Alibaba’s revenues also come from services like Cloud and digital media and entertainment. Both Amazon and Alibaba are investing considerable resources in going global. In fact, as reported on The Economist Amazon has spent over $5bn in India, while not long after Alibaba invested $500m into an Indian digital-payments company. The reason I focused on this metric is that it’s interesting to see the difference in margin between Alibaba and Amazon. As we’ve seen in the Amazon cash conversion cycle, the company can grow aggressively even by keeping a tight margin. The war between Amazon and Alibaba business models is still to be fought.